I applied for a zoning permit last week to have a swimming pool installed at the house. It wasn't too complicated but you still had to pick up the forms from the Town Office, fill them out, draw a diagram with the structures and property boundaries, submit the forms, wait wait wait, nag nag nag, return to Town Office, pay for the permit, and finally pick up approved permit. But wait, now you have to display the permit in your house window for 15 days. Geez, all I want to do is install the damn pool! 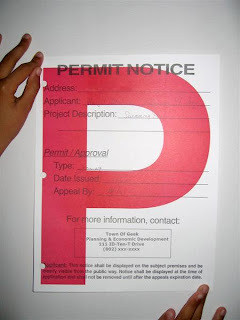 Picked up the permit from the Town Office today (7/16/07). Read the permit closely, I modified it for your entertainment pleasure.